We started with one of the simplest and cleanest vintage mic circuits in history, Neumann's KM84. You don't need 500 components to make a great microphone; we'd agree with Neumann engineers that the simplest solution is often the best. In a circuit with such a simple audio path -- capsule, JFET, capacitor, transformer, in that order -- every one of those components is critical. We knew the transformer would have to be something special, so we tested six of them, including models from the biggest names in audio transformers. The best performer of the bunch was our own US-made, custom-wound 6.5:1 unit, which delivered the best combination of measured performance (read: harmonic distortion) and sound quality. Every single-stage JFET circuit has limited headroom. It's the nature of the design. It only works well if the JFET is selected and biased properly. We always cringe when we see other DIY microphone circuit kits that gloss over this critical detail. "Adjust bias until the drain hits 10V," they say. We've put that advice through our distortion analyser. The results aren't pretty. So, we know better than to leave JFET bias to chance. To that end, we built a fancy selection and test rig. We plug in a JFET, inject a 1kHz tone, and test the transistor for output level. Then we dial in the ideal bias point for minimum distortion. There is a very narrow range of bias values that deliver the absolute minimum distortion for any given JFET. If the device under test doesn't exhibit the necessary drop in 2nd H distortion, we reject it and start fresh with the next JFET. For those that meet our distortion spec, we make sure we have a fixed bias resistor value in stock that is within the target range. If not, that JFET gets skipped. Once we've found the ideal low-distortion point for every JFET, we supply a second, alternate bias resistor, selected to add 10–12dB of 2nd harmonic content. Although this runs contrary to everything we believe a well-designed microphone circuits should do, we'd rather give engineers the choice. If you're building a mic primarily for vocal use, and you want to experiment with a bit higher 2nd Harmonic content to give more weight to the tracks, build your mic with this alternate bias resistor. The standard T-47 kit comes with an aluminum microphone body with a satin black anodized finish. The MicParts logo has been laser-engraved on the front of the body. Alternatively, you can choose a custom powdercoated color; see the options here. The grille, for all body color options, is a 2-layer brass mesh with satin nickel finish. The body has no external switches. This microphone has two internal switches, one for pattern (C/O) and one for pad. To access the switches, spin the end cap off of the bottom of the mic, and slide the body sleeve down. It is best to unplug the mic from phantom power before opening the mic. What's the difference between our S-series (Schoeps style) RK-47 mic kit and the T-series (KM84 style) RK-47 mic kit? Both have high sensitivity -- higher than most commercial microphones. Both have very low self-noise. The S-47 uses a 2-stage transformerless circuit that is very pure and uncolored. The T-47 uses a single-stage transformer circuit that will exhibit overload characteristics when pushed -- as is true of all vintage mics with transformers. That is in fact one of the reasons vintage microphones have such an appealing sound. In terms of the build experience, the T-47 is easier to build than the S-47, simply because there are only half as many components. The T-47 kit was reviewed by Ask Audio. The reviewer put it up against a vintage Neumann microphone in the studio and remarked that "it was extremely difficult to tell the difference." The Rycote Invision USM-L is the shockmount we recommend for the T-47. Its "Lyre" suspension offers superior mechanical isolation, without inducing sympathetic resonance or hum like many elastic mounts. The universal design fits any cylindrical LDC mic up to 55mm in diameter. Can't DIY? We'll build it for you! 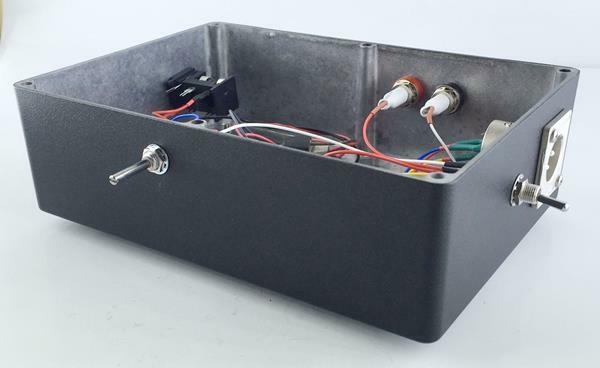 If you're not interested in building this kit yourself, we can build the microphone for you. See our finished T-47 microphone -- hand-built to order in California (usually ships within 7 days).